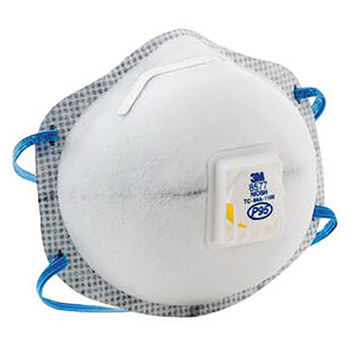 Use the 8576 P95 Particulate Respirator with nuisance-level acid gas relief in aluminum reduction, petrochemical manufacturing and glass etching applications where particles and nuisance levels of hydrogen fluoride, sulfur dioxide and/or chlorine are present. Use the 3M 8577 P95 Particulate Respirator with nuisance level organic vapors relief where particles are found with low levels of organic vapors. Applications include undercoating, food processing and petrochemical operations. Both respirators feature the 3M Cool Flow Exhalation Valve and a nose clip for enhanced overall comfort and fit of the respirator. 10 per box. Do Not Use For: Gases and vapors, including those present in paint spraying operations, oil aerosols, asbestos or sandblasting. Aerosol concentrations that exceed 10 times the OSHA PEL, or applicable government regulations, whichever is lower. This respirator does not supply oxygen.